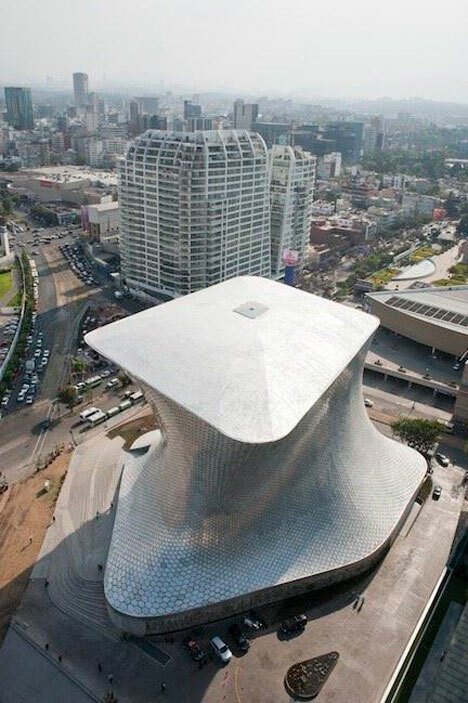 FREE Fernando Romero EnterprisE have completed this anvil-shaped museum in Mexico City, with a windowless facade composed of hexagonal aluminium tiles. 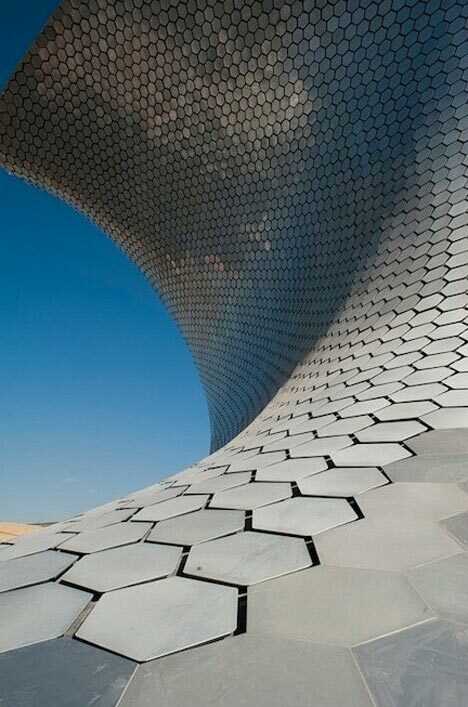 The Museo Soumaya is constructed of 28 steel curved columns with different diameters and geometries, which create its irregular form. The building widens at the top, where a roof suspended from a cantilever allows natural daylight onto the top floor gallery. The museum will house over 6,200 Latin American artworks in a continuous exhibition space spread across six storeys, as well as an auditorium for 350 people, a library, offices, a restaurant, a gift shop and a lounge. Photography is by Adam Wiseman. 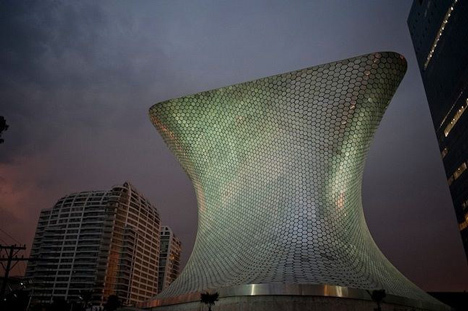 Mexico City–Designed by FREE Fernando Romero EnterprisE, Museo Soumaya opened to the public on March 29, 2011 after four years of development. 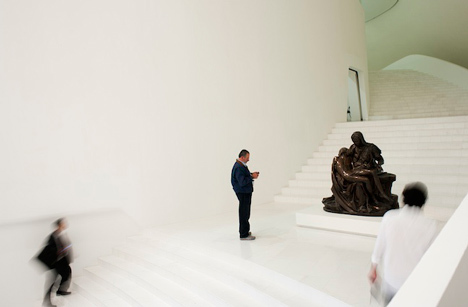 The Museo Soumaya houses one of the most important art collections in Latin America with over 6,200 artworks and 60,000 square feet of exhibition space. 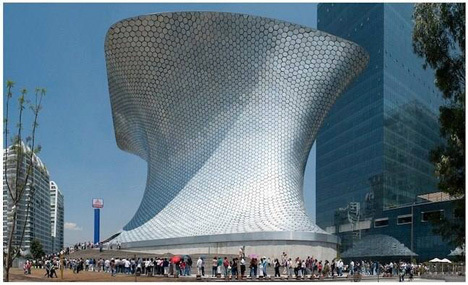 The Soumaya Museum is located in a former industrial zone dating from the 1940's which today presents a very high commercial potential. 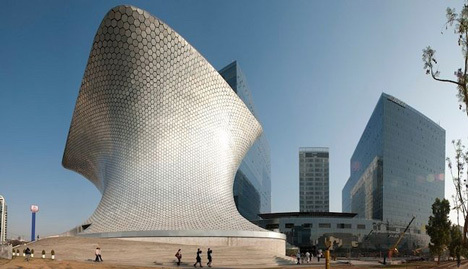 The Soumaya Museum plays a key role in the reconversion of the area: as a preeminent cultural program, it acts as an initiator in the transformation of the urban perception. 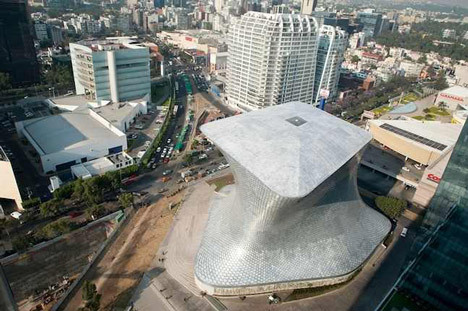 Its avant-garde morphology and typology define a new paradigm in the history of Mexican and international architecture. 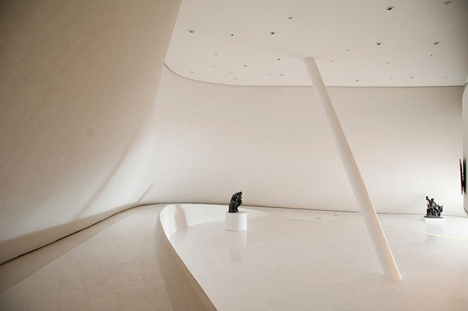 From the outside, the building is an organic and asymmetrical shape that is perceived differently by each visitor, while reflecting the diversity of the collection on the inside. Its heterogeneous collection is housed in a continuous exhibition space spread over six levels, representing approximately 60,000 ft². The building also includes an auditorium for 350 people, library, offices, a restaurant, a gift shop and a multi-purpose gathering lounge. The shell of the building is constructed with 28 steel curved columns of different diameters, each with its own geometry and shape, offering the visitor a soft non-linear circulation all through the building. Located at each floor level, seven ring beams provide a system that braces the structure and guarantees its stability. The top floor is the most generous space of the museum; its roof is suspended from an impressive cantilever that allows natural daylight to flow in freely. In contrast, the building's envelope is nearly opaque, offering little and scarce openings to the outside. This gesture can be interpreted as an intention to create a protected shelter for the art collection. 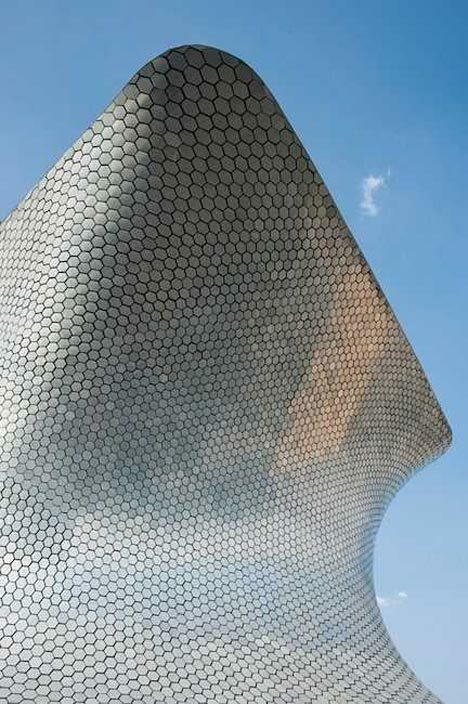 The façade is made of hexagonal aluminum modules that optimize the preservation and durability of the entire building. 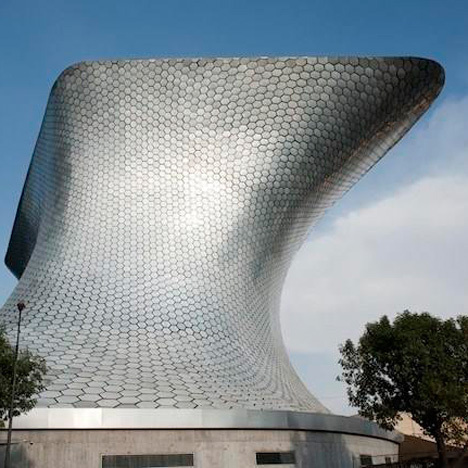 "The Museo Soumaya is an extraordinary structure rising up from the earth's crust as a multi-dimensional icon," Raymund Ryan, Curator, The Heinz Architectural Center.